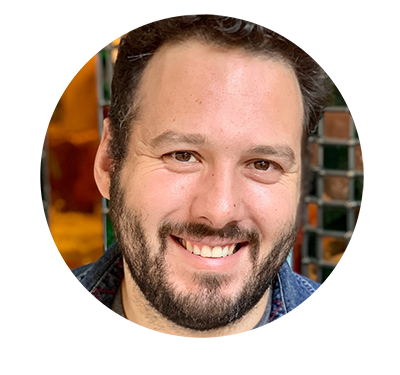 Matt Herman - How many women in New York are pregnant right now? How many women in New York are pregnant right now? When I found out that J was pregnant, my first thought was OMG, I’m so excited to be a dad! My second thought was, I wonder how many other women in New York are also pregnant right now? Knowing that there was plenty of health and demographic public data available, I was pretty sure I could answer this question. After a little googling, I found this brief from the Centers for Disease Control and Prevention (CDC) which details how to estimate the number of pregnant women in a geographic area. Bingo! The NYS Department of Health reports this data at the county level, so I will calculate results for each of New York’s 62 counties.1 I will also use demographic data from the American Community Survey to contextualize the results. The first step is to scrape and clean the vital statistics data from the NYS Department of Health website. Now that I’ve got all the Department of Health data cleaned up, I’ll join the raw numbers for population, births and abortions into one tibble and calculate rates per 1,000 women of reproductive age for births and abortions. I’m also adding the national fetal loss rate of 17.9 per 1,000 women of reproductive age to each county.2 After I join all the parameters, I can calculate the pregnancy rate using the expression specified above. Next up we’ll download county-level demographic data from the American Community Survey (ACS) using the wonderful tidycensus package. This package gives you easy access to Census API and as a bonus has the option to download TIGER/Line or cartographic boundary shapefiles and convert them to sf objects containing population estimates. With the addition of the county geometry data, I can do some mapping to see if pregnancy rate appears to be related to geography. Now I’ll join the Census variables and geographies with the rates I calculated from the NYS Department of Health to create one final data frame with everything I need to summarize and map the results. If you’ve never worked with an sf object before, it is essentially a tibble with an additional column specifying the coordinates of the geometry associated with each row. So in this case, each row is a county and the geometry column is a list-column of XY coordinates that specify the shape of each county polygon. An sf object prints like a tibble, but it includes some additional information relating to the geometry at the top. I’ve got the data cleaned up and I’ve calculated all the rates and proportions we need, so now I can do some exploring and mapping. First, I’ll look at raw numbers of pregnant women since my initial question was, how many women in New York are pregnant? There are aproximately 209,474 pregnant women in New York State right now. This is 5.2% of all women of reproductive age (15 - 44) living in New York. But since I have this data at the county level, I can take a look at differences between counties. I know that more populous places will have more pregnant women, but is the proportion of pregnant women consistent across the state? To explore that question, I can make a chart showing the percentage of women of reproductive age who are pregnant in each county. "who are pregnant in New York State by county"
"Survey, 2012 - 2016, Table B01001"
It looks like the percentage in most counties is between 4% and 6%, but there are some outliers, especially at the high end. In Jefferson County, 7.5% of women of reproductive age are estimated to be pregnant, well above the statewide average of 5.2%. 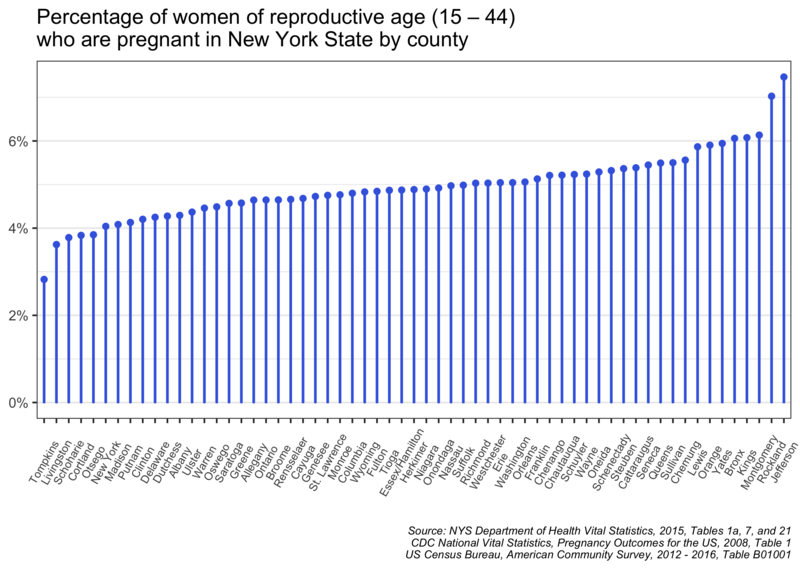 Other counties with above-average pregnancy percentages are Rockland, Montgomery, Kings (Brooklyn), and Bronx counties. Finally, I’d like to put these results on a map. This is relatively straightforward since I already downloaded county geometries along with my Census data. But, I had some trouble figuring out how to best represent total pregnancies as well as pregnancy rates. I landed on two maps for these two phenomena. First, to show the raw numbers of pregnant women, I’ll make a dot-density map where each dot represents 50 pregnant women. This is achieved quite easily in the sf package by using st_sample(), which randomly creates a given number of points within a polygon. Then using the tmap package, I plot these dots on top of New York county polygons. 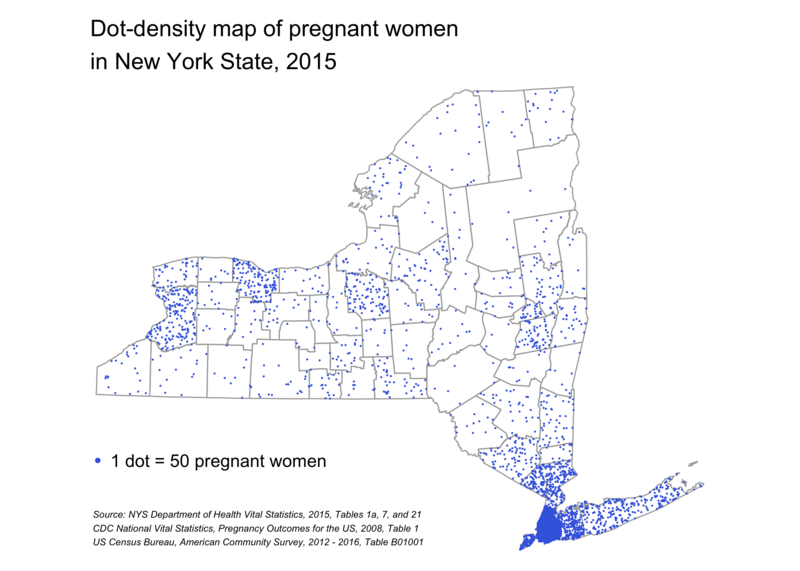 This map does a decent job of representing where pregnant women live in New York, but it more or less looks like a map of total population density in New York State. To show the variation observed in pregnancy rates, I need to make a map with these relative percentages, rather than total numbers of pregnant women. To do this, I turn to a choropleth map where the colors of the counties represent the percentage of women of reproductive age who are pregnant. And to spice it up, I’ll make this map interactive and add a basemap and popups with detailed data for each county. "Fetal Loss Rate (per 1,000 WRA)" = "fetal_loss_rate"
I’m not thrilled with this map, partly because the binning of the pregnancy rate is somewhat arbitrary. (I also can’t figure out why knitr/blogdown/hugo is stripping the nice formatting from the popups!) But with this map, we generally know which counties have relatively high percentages of pregnant women. It also appears that there is not a terribly strong relationship between geography and pregnancy rate. In other words, the counties with high pregnancy rates are relatively spread out in the state rather than tightly clustered. This suggests that are other, non-spatial factors that are associated with the pregnancy rate. Wow, that was longer than I thought! But I hope you found it interesting/useful. Look out for more posts in the future exploring the covariates of pregnancy rates (as well as on other topics!). Also, I very much welcome any suggestions for how to improve the code or visualizations above.